This recipe for super cute mini orange sponge cakes are filled with whipped cream and blood orange curd. They’re a little fiddly to make, but well worth it if you’re looking for dainty additions to an elegant afternoon tea. There’s also a recipe for the curd which is sweet and zingy with an attractive strawberry pink colour. If you’re looking for more miniature treats, read on for a book review that might be of interest. Otherwise, head to the bottom of the post for the blood orange cakes recipe. Finesse and elegance are not my strong points. I like my bakes to look homemade. Taste and good quality always takes precedence over looks, but I do admire fancy patisserie and occasionally hanker after such prettiness in my own kitchen. 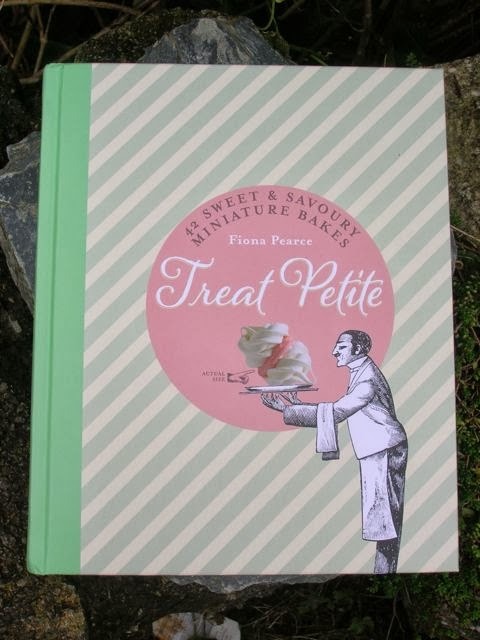 Bite sized pieces of delectable cuteness are on trend, so when I was sent Treat Petite: 42 sweet & savoury miniature bakes by Fiona Pearce to review, I thought my moment had come. The pictures of little dainties in the book really do look rather appealing and I had airy and unrealistic visions of hosting elegant cocktail parties serving decorative sweet and savoury canape sized bites. As I turned the pages of the book, my dreams became even more grandiose: cinnamon meringues made to look like mushrooms, tiny French macarons, gold dusted caramel shortbreads, biscuits done up in ribbons, mini croquembouches and tiny little savoury tarts. How hard could it be? I took one look at the page of basic tools and equipment and came back down to earth with a bang. Squeeze bottles to dispense exact amounts of liquid and to flood biscuits, piping tubes for dainty choux pastry, mini pastry brushes for dusting on edible lustre – I was starting to tremble. However, as I turned the pages, my breathing slowed and I realised this particular Cinderella might make it to the baking ball. 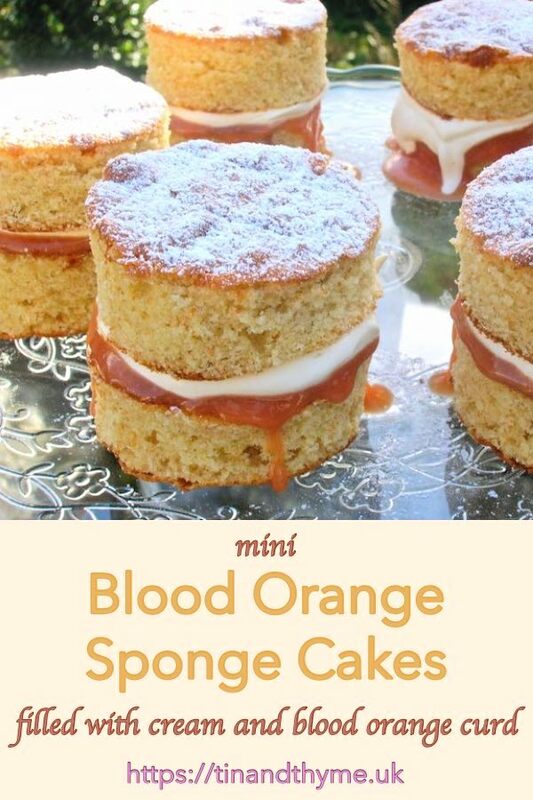 Miniature blood orange sponges. How hard could they be? Treat Petite is divided into eight chapters and I was very glad to see that Chocolate was one of them. Strangely, that was the first place I headed. I breathed a sigh of satisfaction; a book with a recipe for chocolate brownies with salted caramel frosting, could not be a bad one. And I was right, the recipes are interesting and sound tempting too. I have a particular abhorrence of pretty cakes that have the taste and texture of cardboard when you bite into them – all style and no substance. Chocolate cups with mango mousse reinforced my thoughts that the flavours and recipes used were not going to be run of the mill ones. Profiteroles with blue cheese mousse anyone? The other chapters were sensibly categorised: Sponges, Meringues, Pastry, Choux, Biscuits, Cupcakes and Savoury. I found the forms these little treats took were also rather original. There is endless fun to be had with the coconut noughts and crosses, the noughts being one colour and the crosses another; cute square chocolate pastry cases filled with white chocolate ganache looked both rustic and chic at the same time; coffee bean biscuits which are the same shape and size as a coffee bean struck me as particularly wondrous. Part of me wanted to try making some immediately, but my more realistic side put a brake on things. I am not good at faffy activities and quickly lose patience. The instructions are simple and easy to follow. I had a go at making chocolate cupcakes to celebrate Chocolate Log Blog’s 5th birthday. The only change I made was to add coffee to the mix rather than water. They were a great success and tasted delicious, although I used my own icing rather than the peanut butter one suggested in the recipe. The amount of mixture also gave the correct number of cakes stated, something I find is not always the case in baking books. As these Treat Petite dainties are all about the show, pictures are essential. 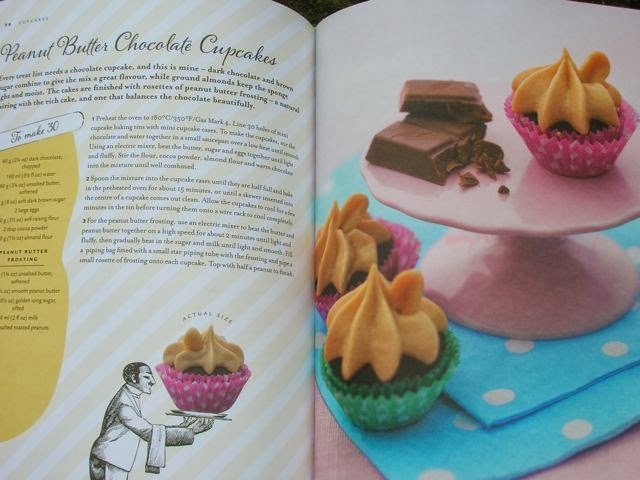 Each recipe comes with enticing photographs on one side of the page, together with a handy picture showing the actual size of the final bake on the recipe side of the page. All in all, I think this is a delightful little book. It has a hardback cover, is attractive and full of good ideas. Handy tips, such as making chai-spiced palmiers with leftover bits of puff pastry, are scattered throughout. If like me, you find dainty a little daunting, you can always scale up the sizes to make something a bit more substantial. I hadn’t come across the author, Fiona Pearce, before, but this is, apparently, her second book. In the about page, she declares that she “teaches cake-decorating classes at Cakeology in south-west London and has written and contributed to a number of baking and craft books and magazines”. She also has a number of cake decorating tutorials on her blog Icing Bliss for those keen to learn how to make sugar flowers, ruffles and other such fancy decorations. Although I have a number of recipes bookmarked, I decided to go completely off piste with my bake for this post. The book was my inspiration, but I used my own recipe. I wanted to make some elegant mini sponges in the style depicted by the miniature victoria sponges, but when it came to it, I couldn’t quite make them as tiny as 4-5 cm in diameter. I went for something a little more substantial, but still very dainty for me, 6 cm in diameter. I’d recently made some blood orange curd and I was keen to use it. And of course I had to get chocolate in somehow. I’ve found that white chocolate works brilliantly in baking and gives a bit of stability and richness without taking away from the lightness of the sponge. All was going well for a while, but my downfall came when I tried to put the cakes together. I hadn’t got an even rise on the sponge, so most of the discs were slightly wonky. This meant that as soon as I put them together, the top started to slide off the bottom. This wasn’t helped by the curd being runnier than I expected, so the intended elegance was marred by something a little messier – it was more akin to Accident and Emergency than elegant tea party. Hey ho, I was secretly pleased with my mini orange sponge cakes anyway. I’m entering these mini orange sponge cakes with blood orange curd into Treate Petite over at CakeyBoi. The theme this month is love and as I always bake with love and these were destined for both CT and friends, I’m hoping they count. This event is co-hosted by The Baking Explorer. As orange, specifically blood orange, was the main flavour used in these miniature sponges, I’m entering them into Victoria’s Feel Good Food over at A Kick at The Pantry Door. I’m also sending these over to Javelin Warrior’s Cookin W/ Luv Made with Love Mondays. Everything was made from scratch, including the blood orange curd. I was super excited to get hold of these luscious organic blood oranges which have such a short season and aren’t that easy to come by. This is the season, so I’m pleased to enter my blood orange curd into Simple and in Season over at Ren Behan. The blood orange curd is so good, I’m really quite thrilled with it. So, I’m sending it off to Recipe of the Week with Emily over at A Mummy Too. The theme for Family Foodies this month of February is Love of course, And what could be more loving than making scrumptious tiny cakes for all to enjoy? This event is hosted this month by Louisa of Eat Your Veg and alternately with Vanesther of Bangers & Mash. 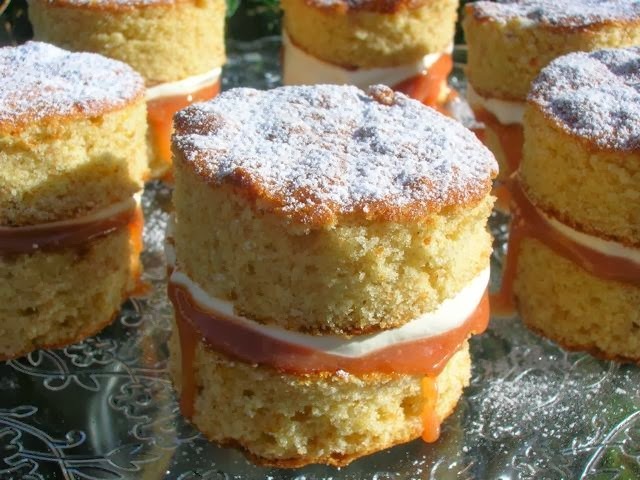 Mini Orange Sponge Cakes. PIN IT. Mini orange sponge cakes filled with whipped cream and blood orange curd. There's also a recipe for the curd which is sweet and zingy with an attractive strawberry pink colour. Add the sugar and grate in the orange and lemon zest. Squeeze in the juice and stir until the sugar has dissolved. Whisk in the eggs one by one and stir on an off until the mixture has thickened - about 20 minutes. Strain through a sieve into warm sterilised jars. Cover with waxed paper discs and seal. Store in a cool dark place and refrigerate once opened. Melt white chocolate in a mixing bowl over hot water (or as I did stand the bowl on my storage heater). Add the butter and sugar to the chocolate and cream together until light and fluffy. Sift in the flour and baking powder and stir gently. Grate in the zest of the orange, then squeeze in the juice and stir once again until just mixed. Scrape into a lined 30 x 20 cm Swiss roll tin and bake at 180°C for 15 minutes until well risen and spongy to the touch. Cut 12 6cm (2½") discs out with a round cutter. Whip the cream, then spread this over half of the sponge discs. Spread some orange curd over the other half and sandwich them together. Dust the tops with icing sugar. 10. Eat the scraps, use in a trifle or make cake truffles. 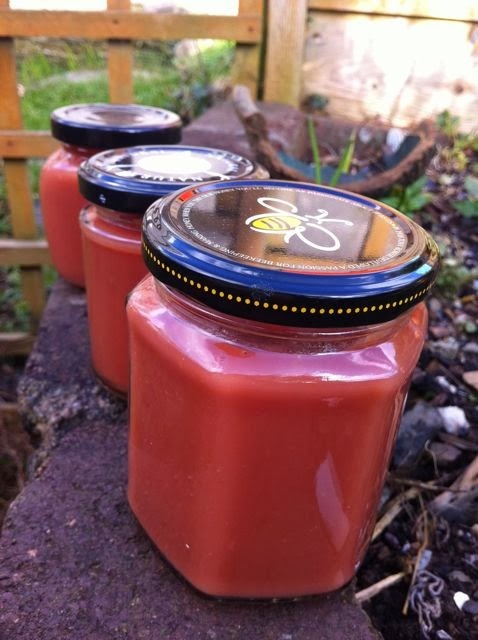 The blood orange curd recipe makes 4 small jars. The orange could be swapped for lemon or use any other fruit curd you desire. Double the cake recipe to make two 8" sponges. The sponge scraps can be frozen for later use. Thanks to Ivy Press for sending me a copy of Treat Petite. I was not required to write a positive review and opinions are, as always, my own. Thanks for supporting the organisations and brands that help to keep Tin and Thyme blithe and blogging. They look beautiful. It’s lovely to serve them like this for a special treat or occasion. Thanks Corina, it did indeed make sponge cakes seem rather special. I just made a batch of blood orange curd too! Yours sounds even better with duck eggs. Those mini sponge cakes look really beautiful and elegant. This looks amazing!! I bet it tastes even better! I haven’t had much luck the few times I made lemon curd, but your recipe makes me want to see if the 4th times a charm! Yum! Thanks Lisa. Strangely, I’ve never made lemon curd. Apple and lemon curd works a treat and I’ve made that several times. Lots of other curds too, but never lemon. I think it’s something to do with the jars of bright yellow shop bought curd that put me off as a child. Good luck with your next attempt. wow, it’s like a double whammy of amazingness… firstly the blood orange curd… er, hello!?!?! How amazing is that.. so glad you found yourself some blood oranges, they are so my favourite citrus fruit… and secondly the amazing cakes, so pretty and so cute… a fabulous post! The curd looks so good! Last time I bought blood oranges they only had the faintest streak of red, and the colour didn’t come through in anything I made – tragedy! I was lucky Alicia, all six of mine were red all the way through. Not sure if you can tell until you cut into them. Or maybe something to do with the variety? LOVE this post as I LOVE blood oranges and wee cakes, so this is a marriage made in heaven! Ah yes Karen, wee cakes sounds much cuter than mini cakes somehow. When you come down to Cornwall, you might get to try some wee cakes!!! I love these, especially that inner layer of beautiful blood orange curd!! Beautiful – what a gorgeous looking curd too. For someone who claims not to do finesse I think these pics prove otherwise! Thanks GG. They are slightly tarter than your average orange and thus quite flavoursome I find. Thanks Kate. Blood oranges are such a sensational colour, it seemed a shame not to use it. And the curd is delicious. You don’t see many blood oranges these days, love the little cakes and the curd! These look so s;pring like. Gorgeous little cakes! Wonderful curd too! I just love blood oranges, such a treat at this time of the year! Thanks Jayne – winter citrus certainly brightens up what can be a dull time of year. I bet you would be perfect at dainty patisserie Alida and suspect you have more patience than me too. 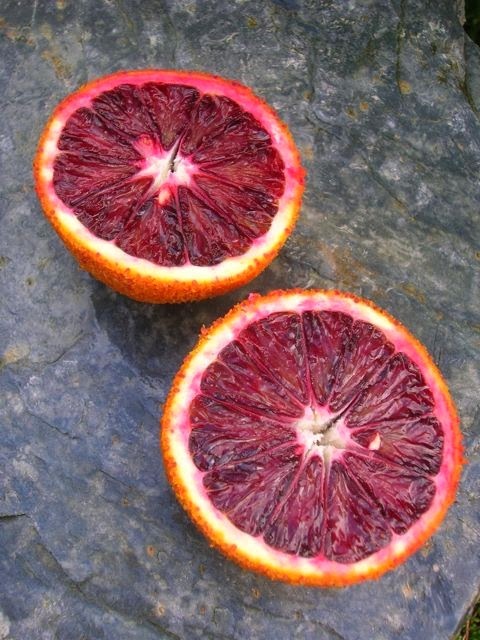 Blood oranges are so dramatic, they are just wonderful at this time of year. gosh this looks delicious! and the cakes look heavenly! I like the sound of Blood Orange cakes. 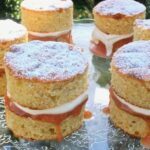 Your petite cakes look adorable and I love the flavour combination of white chocolate with blood orange curd. Yummy! Thank you Tina, white chocolate and orange is a bit more unusual than dark chocolate and orange, but it works. These look so summery (and delicious!) thanks for entering them into Treat Petite! Thanks Stuart – summer? Sigh! Blood orange curd, mmmmmmmmm! Cute little cakes, mmmmmmm! Blood oranges, mmmmmmmm! Thanks, would love to know how you get on Sara. Oh what dainty little cakes of gorgeousness. Love the sound of the Treat Petite book but I’ve so little patience for such finesse! 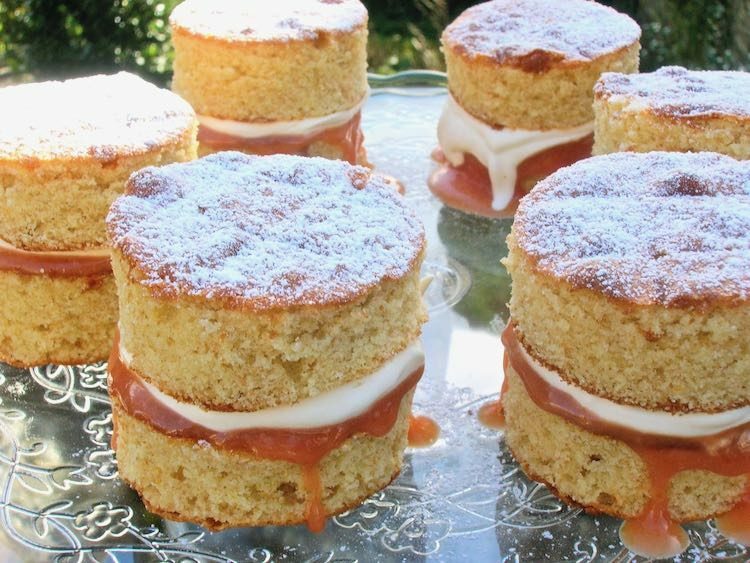 I would however happily demolish a few of your cakes, the blood orange curd addition sounds sublime. A wonderful Family Foodies ‘Love’ entry! The curd looks amazing and I adore blood orange but haven’t seen them available anywhere locally. I’ll have to do a bit more hunting for this curd recipe! Thanks Kimberley. This was the first year I’ve been able to get hold of any and I think the season is over now – bookmark it for next year? Thanks Deena. We had some of the curd spread on pancakes the other day and that was gorgeous too. Don’t be ashamed, it’s so exciting to know there are still plenty of things out there to discover and try out. This was my first time. I just seen this picture a friend has on pinterest and I am drooling!! These look superb and I am going to try and make them this weekend. Yummy! Thank you! Thank you for coming over to visit Anna-Maria and for taking the time to comment. Do let me know how you get on if you do get around to it. I love curd. I’ve never thought to try making it with duck eggs, I can imagine how much richer and more delicious it is. I find duck eggs work well because the yolks are such a high proportion of the egg. I’m totally with you in that cakes that look beautiful but taste like garbage are the worst. Talk about a let down. I would take a fabulous, homey cake any day over a fancy, meh cake. Thank you Tina and I do apologise for only spotting your message just now. I’ve just got a load of blood oranges in and wondering what to make with them.